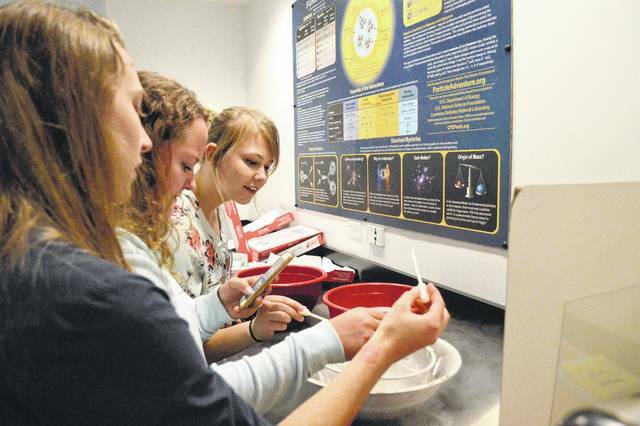 Ohio Wesleyan University students, from left, Annie Vitti, Katy Tuggle, and Becca Strider drop ice cream mix into a strainer in a bowl of liquid nitrogen. The ice cream freezes instantly to become tiny pellets. The strainer is taken out and emptied into another container. The ice cream, styled after the Dippin’ Dots brand, was served to about 20 students Friday at the OWU Schimmel/Conrades Science Center. It was organized by the Women in Science Organization.